Discussion in 'Android Devices' started by mavsman13, Jul 26, 2013.
thisisnotadrill, shavatek, Scholzpdx and 4 others like this. I can officially confirm this. I just tried it and it successfully rooted my F3. Thank you for bringing this to the forums. shavatek and skarface1988 like this. Just placed this phone on order. I see some are using Motochopper to root this phone. Does it place replace the stock recovery with CWM? I always like to root my phone to have total control over it, but want to make sure that CWM is also installed on it in case of any oops. There is no official custom recovery for this device yet. Ive seen other post if you go straight to recovery after rooting. It may get black screen. And can factory reset on its own. 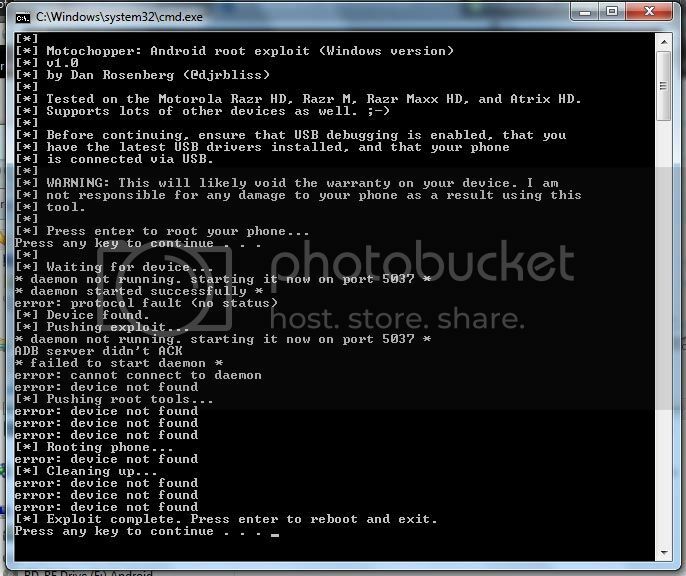 So dont attempt until we all see the official recovery..
Has anyone rooted the phone before activation? IIRC some phone would not activate after being rooted. My phone is here and I'm trying to root it so I can transfer all my data from TiB and I'm not getting access for some reason. I finally found on LG site drivers for Virgin Mobile. Installed them, even rebooted the computer. Have the phone set to USB debugging. Turned off firewalls and anti virus programs. This is what I get when trying to run motochopper. Make sure you download the right driver model for you exact phone. And make sure your computer can detect/roconize your device. Amd than run motochop over n over til it works. It happen to me and i have to do it like 3 or 4 time..
Just wondering if this indeed confirmed working etc. The reason I ask, is that in the root sticky, there is no link for a root guide. As far as I know, this method has been working. I myself rooted this way. Had the wrong driver at first. Mine rooted on the first try. I rooted it after activating the phone. Yes it works. If you see anything else that can be added, let me know by p.m. or another guide (member in green) or mod. I'm having some trouble rooting using this method. It keeps saying "adb is not recognized as an internal or external command, executable program," and something else i dont remember. Any ideas on how to make it work? What do i download to root optimus f3 with virgin mobile? Ive tried motochopper but it keeps saying that is doesnt find su. Please help asap!!!!! Did you download the driver from LG's site? Sorry for not providing more info in the OP. I really don't know much. I just noticed that this method worked for a lot of LG phones so I tried it out. Just wanted to pass it along. Um yeah you definitely have to extract the files first. Motochopper worked for me instantly on the first try. I guess my next question is what apps have you removed? Motochopper worked wonderfully. I just got the f3 today (virgin mobile), and started my customization process (beginning with rooting) right after activating. Just got this phone today (cracked my Optimus Elite's screen, oops), rooted successfully. Cannot wait until ROM development begins, if it does. Installed LG drivers, ran motochopper, ran superuser, ran root checker - verified, ran update for superuser, ran root checker - verified. I'm Rooted! Now that I have rooted and have Link2SD working can I turn off USB debugging? If you ran the run.bat file, you MUST unzip the files first...then it should work. Hope that helped. Root worked first try. My very first! Thanks!